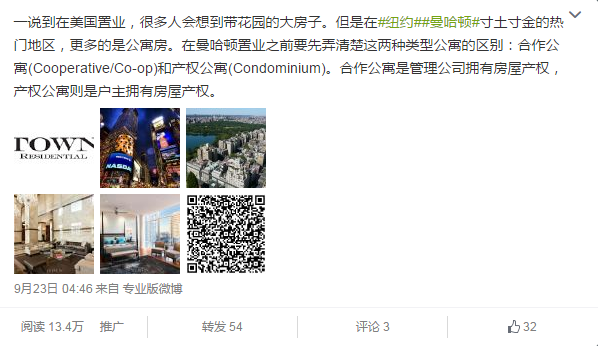 In this case study, discover how a leading New York real estate firm used Chinese digital marketing to generate qualified leads. Their online strategy, led by Sheng Li Digital, focused on direct response campaigns and social media to connect with Chinese customers fluently. Overseas investment tops the list of Chinese spending priorities. TOWN Residential wanted to create new opportunities for international real estate buyers while elevating customer service to grow a local audience. Founded in 2010, TOWN Residential is a residential real estate firm specializing in luxury real estate sales, rentals, and new development marketing with nine locations in Manhattan. The Chinese-speaking demographic presented a great opportunity in New York real estate, particularly in sales. The goal was to capitalize on this opportunity through Chinese digital marketing strategy and tactics. 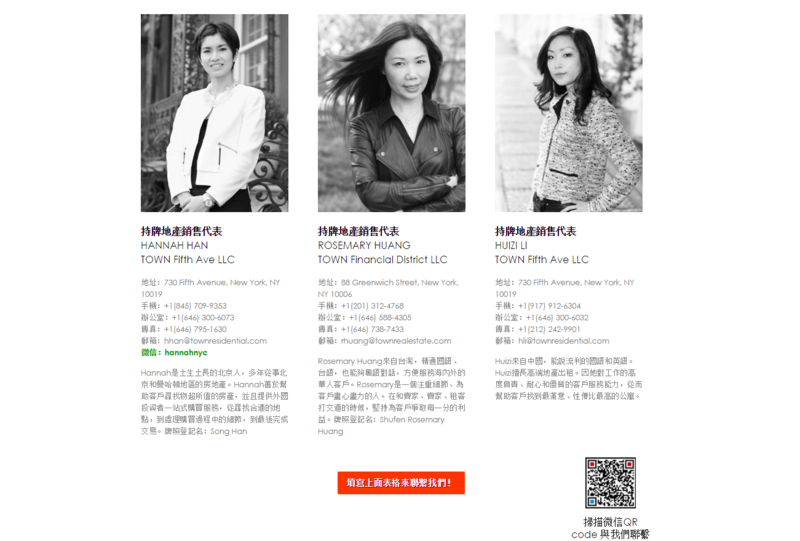 IN ORDER TO PRESENT THE LEVEL OF SERVICE TOWN RESIDENTIAL OFFERS, SHENG LI DESIGNED A LANDING PAGE TO SHOWCASE THE FIRM’S EXPERTISE IN NEW YORK REAL ESTATE. 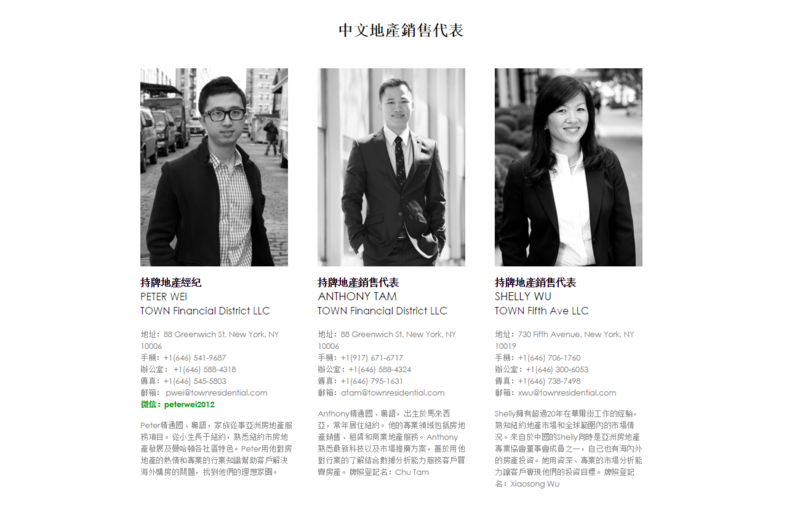 The landing page contains traditional Chinese text that highlights TOWN’s story, experience, and profiles of each Chinese-speaking sales representative. The landing page is highly optimized for organic search in Chinese. 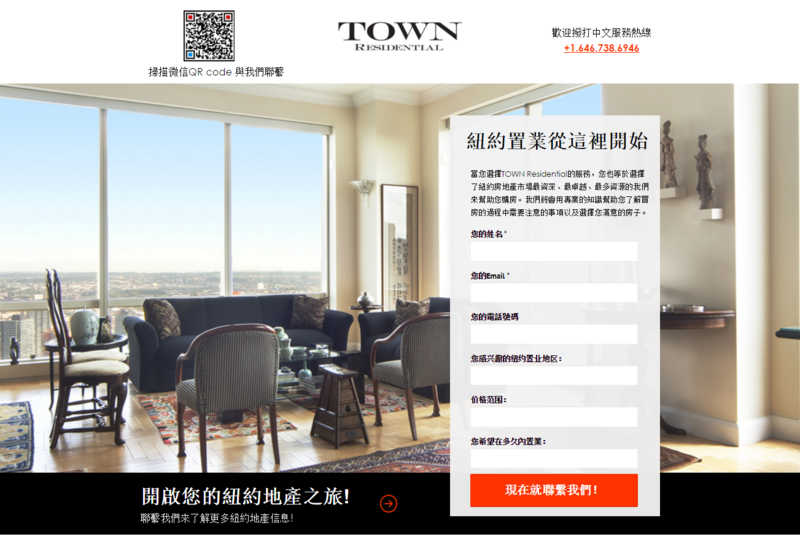 In addition, we incorporated strong calls-to-action such as a ‘Contact Us’ form and WeChat QR codes to encourage potential buyers to easily contact TOWN’s Chinese-speaking agents. With any campaign targeting Mainland China, it is important to keep in mind that the volume will be tremendous, and the targeting needs to be narrowed down granularly in order to reach the most relevant traffic. In this case, we chose to utilize the search engine with most of the search marketing share in China, Baidu, to effectively drive traffic to the Chinese-language landing page. Baidu offers numerous advertising products across desktop and mobile, including SEM, Brand Zone, Brand Generic, and Display. The direct response campaigns were complemented with a social piece on Weibo, China’s Twitter-like microblogging/social media platform. 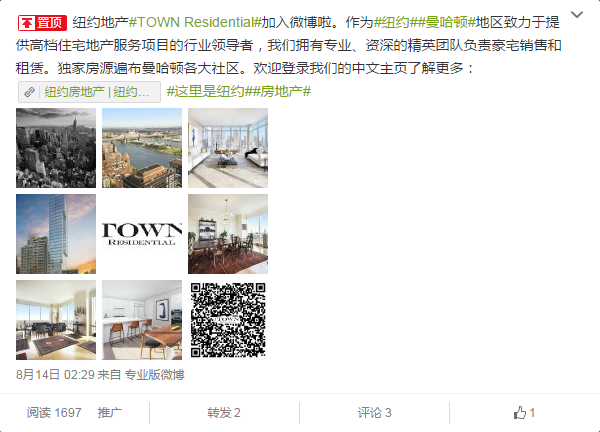 We set-up and verified TOWN Residential’s Weibo account, as well as developed supporting advertising. 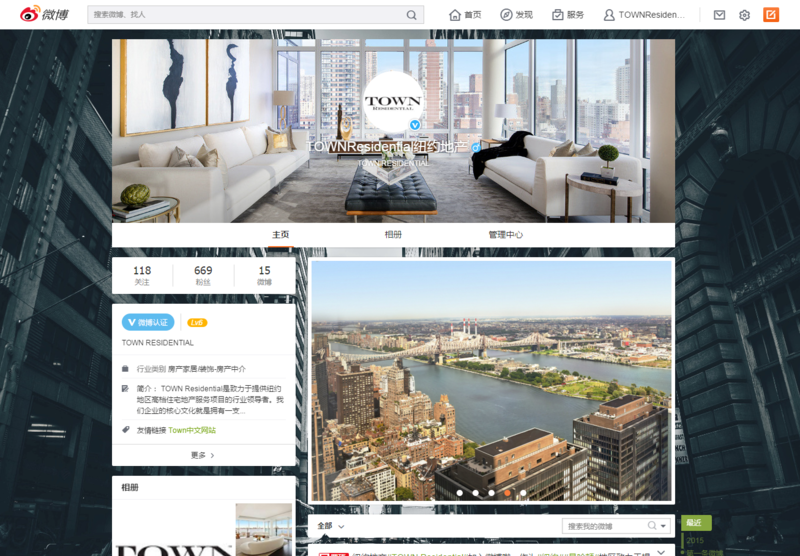 Sheng Li produced organic and paid posts to promote TOWN Residential’s service, providing industry news and educational information on New York real estate, while introducing the most desirable Manhattan neighborhoods to Chinese investors. It was just as important for TOWN to reach prospective local Chinese buyers as well as overseas investors in China. The Google AdWords campaign capitalized on local U.S. interest from Chinese prospects. In addition, there are 1,200,000 Chinese-speaking people on Facebook across the U.S. Facebook was also a key channel in reaching local U.S. prospects — Sheng Li allocated budgets to boosting content as well as growing the account via Facebook Custom Audiences and retargeting. The landing page received over 18,000 pageviews in just three months from Chinese prospects, while the Weibo account grew significantly by 700 followers with great engagement. We improved social media growth on each channel and integrated analytics to ensure social media efforts were focused on direct response. Sheng Li Digital helped TOWN Residential build a database of high-quality leads from the Chinese-speaking demographic and a strong online presence in the real estate industry.